How can we contribute to economic and social justice? Many farmers have asked some version of this question before. We are, by nature of our work, invested in our communities. But as you know well, farming is hard, time-consuming work, often with limited financial rewards; aligning our social justice principles with the day-to-day grind of the farm is a constant struggle. This challenge is only greater in low wealth communities, where people are often without the means to afford and access healthy, sustainably grown food. This workshop is geared towards farmers who want to engage in dialogue about how we, as part of this larger food system, can create change within our work that positively impacts your farm’s resiliency. Examples include social justice issues on the farm, creating community partnerships, and providing local food to low income customers–especially in light of the $8.3 million in SNAP dollars spent on local foods since the creation of HIP. Leah Penniman of Soul Fire Farm with Maggie Cheney and D. Rooney of Rock Steady Farm & Flowers will draw from their experiences, research, and community connections including work from Soul Fire’s recently published manual “Sowing the Seeds of Food Justice”. 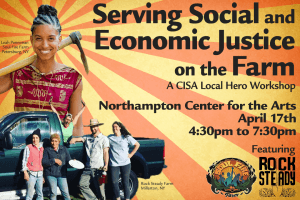 They will discuss how they make their farms financially viable and socially responsible; we will dive into food distribution models, cooperative ownership, and methods of community collaboration. There will be small group discussion and attendees will walk away inspired by and ready to take steps towards implementing changes in their work. Cost for the workshop is free. Food will be provided. Email or call Stevie (413-665-7100) if you have questions about the workshop or location accessibility. This workshop is supported by the National Institute of Food and Agriculture, U.S. Department of Agriculture, under award 2016-70017-25423.